If you’re an avid shooter, you know that the proper ear protection can mean the difference between prolonged hearing damage and perfectly intact eardrums. Especially when you’re firing off rounds in an indoor range, ear protection is a must. Even if you don’t think you need a guard, consider that the suggested safe exposure limit to sound for eight hours a day is 85 decibels (dB). Normal conversation comes in at around 60 dB, a concert may reach peaks of 105 dB, and that firearm you keep shooting off near your ear can reach as high as 140 dB. As with every other firearm accessory, however, you’re faced with a slew of choices that make the buying process a veritable nightmare. Weighing your options also involves looking at your habits, such as time on the range and caliber of firearm that you’re shooting with. Much more goes into the buying process, of course, which is why we’ve compiled this list of the best ear protection for shooting and a comprehensive buyer’s guide that will go into the more minute details to help you pick out the muffs or plugs that work for you. If you ever had to live in cold weather, then you likely know earmuffs as a means of keeping your ears from turning that bright, painful red. In the world of shooting, earmuffs serve a different purpose, like keeping the noise of gunfire from damaging your hearing. These options may also keep your ears warm, but their bulkier design is mostly intended to provide protection while you’re at the range. Available in electronic and passive, these are the best earmuffs out there to protect your ears with. Before our in-depth reviews, here is our favorite Top 3 Shooting Earmuff at a glance. Do you have a soundtrack you love to listen to while firing off rounds at the shooting range? The Pro Ears Pro Mag gives you the opportunity to listen to what you want to and not the ambient chatter of other shooters. This electronic headset is designed with an input for most media devices while delivering on premium noise cancellation. Each shot is drowned out to a manageable level without sacrificing the quality of whatever media player you’re listening to. Control the volume level of your media device and the level of noise cancellation in case you prefer to not be completely shut out from the world. Pro Ears Pro Mag is equipped with an automatic shutoff, prolonging the life of the two N batteries that they run off of. Fine tune your hearing for a more personalized experience and enjoy a 1.5 millisecond response time. Both cups are connected to ProForm leather ear seals for a comfortable wear. The durable material will last for many uses. 5 mm Jack Input: Listen to what you want to and drown out the world around you. Compatible with most MP3 players and smartphones, you create the soundtrack to your target practice. Customizable Volume: Control what you hear with the adjustable gain control on each cup for a personalized experience. Costly For What it Offers: The Pro Mag Gold may be a fine set of earmuffs, but for the cost, they could have a few more features. All it takes is two AAA batteries to power these tactical hearing protectors, which is a surprisingly low power source considering the ample protection they deliver. 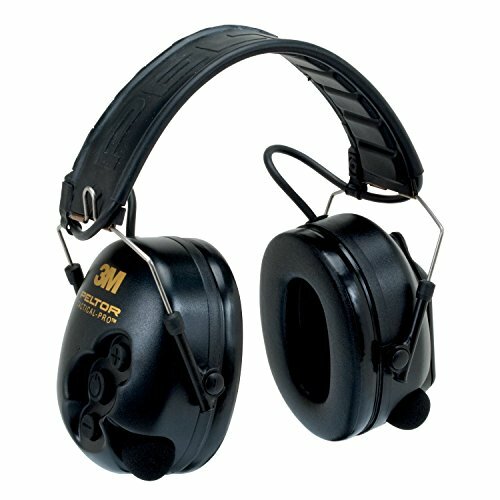 The 3M Peltor is a high-quality and comfortable design that, along with a noise reduction rating of 26 dB, also comes with noise amplification. Cut down on the sound you don’t want while still leaving the option to hear what’s going on around you. This comes most in handy while out in the wilds and leaves you the ability to hear what’s happening around you, especially low-level sounds. Prolonging the life of the AAA batteries is an auto-off feature, which enters a standby mode when not in use for a period of time. On top of the standard noise reduction, the AAA batteries also power an active volume feature that cuts out louder noises ranging as high as 82 dB. Connect your audio device via the audio jack and enjoy being able to hear when people are talking thanks to the low-level noise amplification built into both cups. Low-Level Noise Amplification: Don’t miss out on the world around you. The low-level amplification ensures you’ll hear what you need to without sacrificing your hearing when you fire off a shot. Enhanced Noise Reduction: The “active volume” feature further cuts out noises ranging as high as 82 dB. Short Battery Life: Running off of AAA batteries does lend to a shorter battery life, especially during prolonged periods of use. Relatively Uncomfortable: When compared to other models, the cups are not the most comfortable and lack a gel insert for optimal wear. There’s no denying who this set of earmuffs were made for, but the camouflage appearance is not a testament to where they’ll be most effective (for the none camoflage option, you can find them here). The noise reduction cuts out the louder sounds you want to protect your ears from while still allowing you to hear the noises you want. Consider when you’re hunting – you don’t want to subject your ears to every shot from your rifle, but you still want to be able to hear the world surrounding you to pinpoint your target. Walker’s Alpha Series allows users to adjust each earpiece independently, reducing noise amplification or reduction as needed until perfect for the user. While the Alpha Series works just as well in a shooting range, they’re built to be wind resistant for outdoor users. Four microphones pick up all manner of sound and actively cut down on the louder, unwanted noises. The audio enhancement amplifies sounds up to 9x their usual dB so you don’t miss a thing while you’re wearing them. Don’t be concerned about prolonged use – each cup is both comfortable and designed to be anti-microbial. 4 Microphones: Each microphone helps pick up the sounds of the world around you while the noise reduction cuts out higher dB sounds. Independent Volume Controls: Hear better out of one ear? Independent volume controls let you adjust each earmuff to your needs. Specific Design: Not everybody loves camouflage, so it’s plausible that some may steer clear of these earmuffs just because of the very specific pattern. Higher on the noise reduction rating scale than many models, ClearArmor’s 141001 series earmuffs are a powerhouse when it comes to noise reduction. Surprisingly, they don’t even require a power source to reach a rating of 34 dB, but that also means they’re mostly featureless. Even without any extra bells and whistles, ClearArmor’s 141001 are a favorite model for their practicality and quality. A durable and sturdy build could last forever and the lack of any electronic components just means there is less to possible break. It may be tough to determine ClearArmor’s greatest appeal, whether it’s the simple design, effective construction, or incredibly low price, but there is a lot of value built into these simplistic muffs. While on the bulkier side, the 141001 is very adjustable and is comfortable for most users. 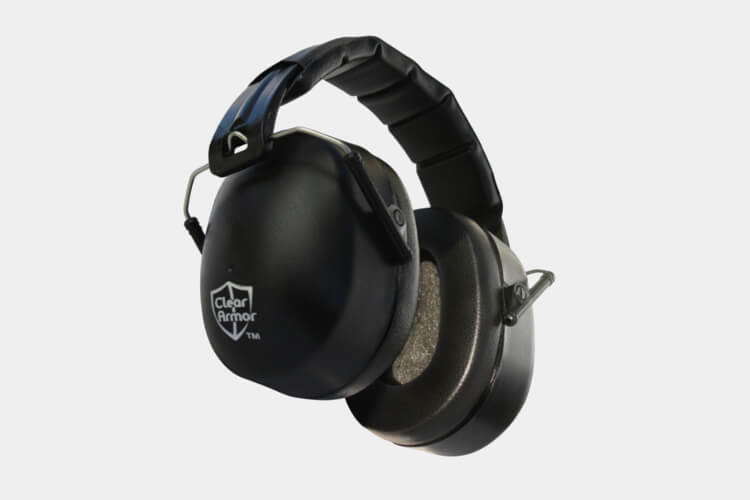 A quality build and simple design lend themselves to the most effective earmuffs when it comes to hearing protection. 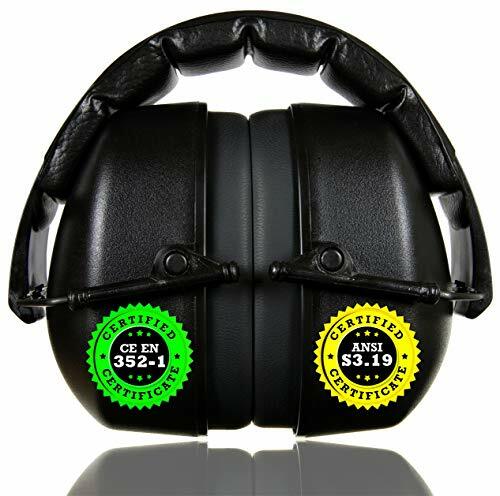 High NRR Rating: At an NRR Rating of 34 dB, these earmuffs are among the highest on the market. Simple and Easy-to-Use: With no extra components to fiddle with, the 141001 model is simple to use. Just slip the cups over your ears, adjusting the padded headband and swivel cup for the best fit. No Extra Features: If you’re hoping to hear lower-level sounds, there is no noise amplification. Want to plug in and listen to your media device? The 141001 has no 3.5 mm jack input. It’s a bare-bones model that may not appeal to technophiles. 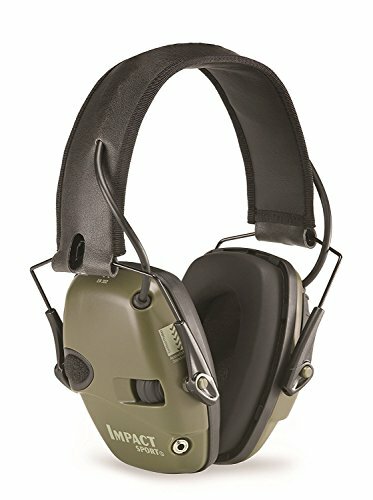 These shooting earmuffs by Howard Leight are rated fairly high on the noise reduction rating scale, but its reduction rating of 30 dB is just the tip of the iceberg. Additionally, these electronic earmuffs can cancel out noises that come in at over 82 dB. When it comes to shooting off high caliber firearms, this is a vital feature in the mission to keep your hearing best protected. When not in use, the four-hour battery-saving shutoff kicks in, otherwise you’ll be able to make use of the 3.5 mm input for most media devices. Shoot to the soundtrack you want to listen to while still enjoying the benefits of reduced sounds from the outside. A built-in directional microphone makes it possible to engage anyone nearby without losing the benefits of noise cancellation. Sound amplification increases low-level noises up to 82 dB so you can still be in touch with the world around you. All of these features run off of two AAA batteries, which deliver a shorter battery life. Active Noise Cancellation / Amplification: These earmuffs cut out all noises above 82 dB but will actively amplify low-level sounds picked up by the directional microphone to keep you in touch with the world around you. Audio Jack: Bring along your media device and listen to your favorite playlist, podcast, or any other audio to hear what you want to hear. Bulkier Build: The wider earmuffs may get in the way of shooting rifles and may not fit comfortably with other accessories, like protective eyewear. Unlike earmuffs, earplugs are a bit more “invasive” as they actually go inside the ear canal. Like earmuffs, however, they do provide a great deal of protection while shooting your firearm. More compact and easier to carry on you, earplugs tend to be for shooters that prefer to have their target practice outdoors and for hunters. Their smaller design and convenience make them better suited than earmuffs when it comes to actively moving or hunting, especially considering earmuffs can get in the way of scoring game. This portable option may be smaller than earmuffs, but they provide the same level of protection. Available in different materials and as either electronic or passive, these are the best earplugs you’ll want to consider adding to your shooting accessories. Before the reviews, here’s our list of the Top 5 Earplugs for Shooting. With a name like “Sonic Defender,” you can expect quality audio protection, and Surefire’s Ear Pro provides exactly that. These simple earplugs fall within the mid-range level when it comes to hearing protection, which is more-than-enough for most caliber firearms. Crafted from a soft, medical grade polymer, the Sonic Defenders are anti-allergic, meaning you won’t have to worry about ear irritation while wearing them. It also adds an extra level of durability that will keep these in your possession for quite some time. One quick adjustment when you first buy them and you’ll be set for as long as you use them. To prevent complete audio reduction of sounds you do want to be able to hear, Surefire’s Sonic Defender is equipped with a stopper that lets you hear your low-level sounds while still providing protection against higher-decibel noises. The patented EarLock retention ring prevent slippage by locking into place at seven different contact points, which prevents slippage during use. No Slip: For the shooter on-the-move, Sonic Defender’s retention ring prevents slippage to keep earplugs from falling out. Filter Caps: Prevent the noises you don’t want to hear from coming through without sacrificing lower-level, “safe” sounds by engaging the filter caps and stopper. Not Effective Against Higher Caliber Firearms: The lower level NRR works fine for low decibel sounds and lower caliber firearms, but it’s less effective when dealing with much louder guns. 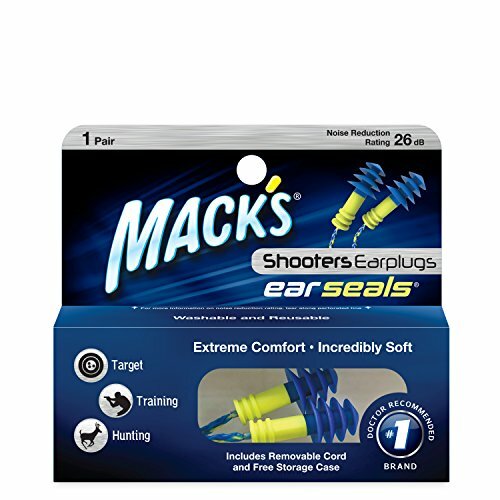 When it comes to protecting your ears from the product of shooting off a high-caliber firearm, Mack’s Shooters Ear Seals Ear Plugs perform well. These earplugs are a unique design connected by one vibrant and sturdy detachable cord. Though they may seem simple in design, Mack’s earplugs are not only affordable, they’re effective. The accordion-like design provides a comfortable fit that cuts out unwanted sounds and a no-slip functionality. Though the pattern is bright and may not be best suited for hunting, the cord can be removed and the earplugs will remain in place. Made from a soft foam, the earplugs are washable, reusable, and durable to prolong use over multiple shooting sessions. Though they’re a plain design, Mack’s Shooters are able to block out louder sounds while still allowing lower decibel noises to come through, making conversation and awareness of your surroundings possible. With the cord detached, the Ear Seals earplugs can be coupled with earmuffs or safety glasses comfortably. Effective, Simple Design: These earplugs are a no-frills option that are designed for one purpose – hearing protection. Detachable Cord: The included cord keeps the earplugs attached when needed but can be detached as desired. Difficult Removal: With the cord detached, the earplugs can be difficult to take out. Best When Paired with Muffs: With a 27 dB noise reduction rating, Mack’s provides decent ear protection but do benefit from added protection and features, like earmuffs with media device support. Depending on how much noise you’re looking to reduce, Topnuna’s 2-in-1 earplugs can be worn two different ways for a variety of dB filters. One side will deliver a reduction rating of 22 dB while the other will increase the reduction rating to 28 dB. When it comes to shooting, the 28-dB rating is best. Even with the higher rating, these earplugs allow you to reduce noises evenly while still letting you hear some of the sounds you’ll want to hear, like music or nearby people. Built from a soft silicone material, the 2-in-1 earplugs are non-toxic and won’t irritate your skin, even after prolonged use. The comfortable wear makes them perfect for a long day of hunting. While small, these high-fidelity earplugs are attached via a simple black cord that can stand up to use and can be stored in the provided aluminum case. 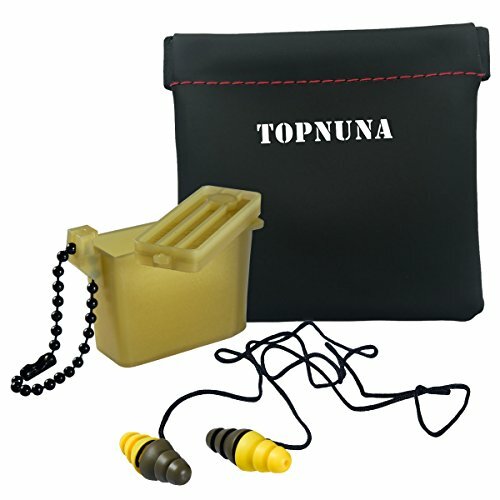 Designed to fit a range of a variety of ear sizes, Topnuna’s brand of earplugs are a must-have for all shooters. Compact Storage: Don’t worry about losing these earbuds as they come with a sturdy and compact aluminum case. Two-NRR Ratings: While the 28-dB rating is great for shooting, the other side offers a reduced rating of 22 dB for a slew of scenarios including concerts and sporting events. 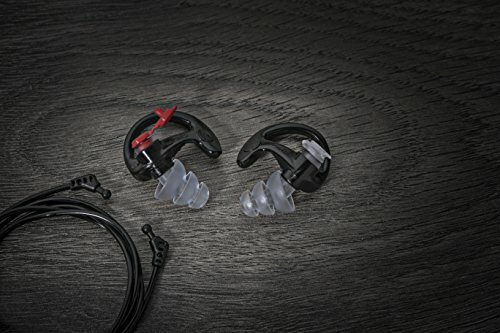 No Extra Features: The simple design is effective, but these earplugs don’t have much in the way of any additional benefits beyond hearing protection. While the Peltor TEP-100 earplugs may not be the best when it comes to their NRR rating, these tactical plugs are feature-rich, making them one of the best on the market when it comes to overall delivery. At a rating of 23 dB, the TEP-100 will protect your ears from lower-caliber firearms, but these electronic plugs offer more than just protection. Being electronic, you may be concerned about water damage, but they do come water resistant. In fact, despite being electronic, they’re no less durable than other options. The entire package looks bulky, but it all breaks down to a very portable option that’s great for shooting ranges and even for hunters. 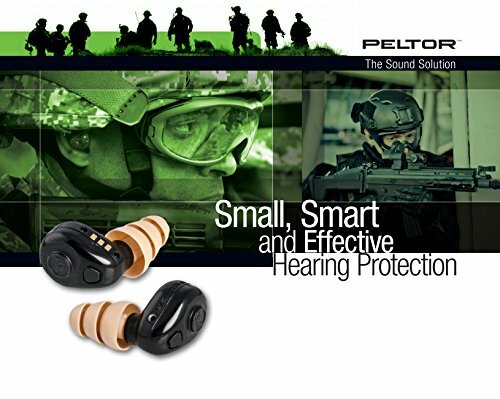 Used by military personnel and law enforcement, these Tactical plugs are a reliable option that uses state-of-the-art hearing protection technology that reduces unwanted noises while still keeping you aware of the environment around you. Lower-volume sounds are amplified, so if you’re out in the wild, there’s no need to fear missing out on your target scampering behind you. The plugs are intuitive and work well in scenarios where the noise level changes frequently. Users benefit from the on board rechargeable batteries, interchangeable ear tips, and detachable cord. Works Well with Fluctuating Sounds: If you’re in an environment where sound levels change drastically, the TEP-100 will provide ample protection without completely drowning out the more important sounds. Added Accessories: Interchangeable ear tips, detachable cord, and a carrying case provide convenience and added features for this compact bundle. Water Resistant: Even in damp environments, these earplugs will stand up to the elements and provide you with the protection you need. High Cost: Of course, all of this comes at a much higher cost than regular earplugs. Compared to most plugs, the TEP-100 is around 10x more expensive. In the way of earplugs, Deibullz delivers one of the higher noise reduction ratings, but that’s only part of the big picture that makes these such a viable option for shooters. 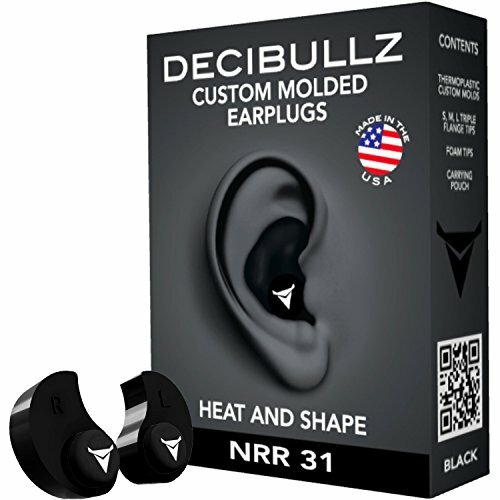 While the noise reduction rating is something to tout, one of the best features of Decibullz is their comfort. Perfect for every type of ear, these earplugs can be custom molded. All it takes is a quick process of heating the molds up and shaping them to fit your ears perfectly. Beyond custom-molded comfort, Decibullz provides an effective reduction in higher-caliber firearm sound, which comes in handy both in the range and while hunting. Available in a range of vibrant or dark colors, Decibullz can be one of the better earplugs on the market for hunters. Since they’re custom-fit for the wearer’s ears, there’s no concern that they’ll fall out, even after prolonged use. Since they are so snug, Decibullz provides ample noise reduction but also make it difficult to hear ambient noise and surrounding conversations. Custom Molded: The custom mold design allows for a snug and a perfect fit for all users, regardless of ear size. Versatile: The snug fit makes them work well with a range of accessories and won’t get in the way. A Little Too Effective: The 31-dB noise reduction rating works well, but also keeps users from hearing ambient conversations and sounds of the wild. No Cord: The Decibullz are a little easier to lose as they aren’t connected via a cord and don’t come with a storage case. Why Do I Even Need Ear Protection? We touched on this briefly before, but it’s incredibly important and worth noting a second time. Firearms can produce damaging levels of sounds, going well above the 85 dB “safe zone”. In fact, every 3 dB above the recommended highest dB of 85 can cause serious and permanent damage to your hearing if exposed for periods of time. When it comes to firearms, the average gunshot hovers around 140 dB, though higher caliber guns can go even higher than that. Consider, also, that you don’t just fire off one shot and you’re done for the day. Each time you pull that trigger with unprotected ears, you’re subjecting your eardrums to more than 55 dB above the recommended noise level. In the long run, that could cause permanent hearing loss. Hearing protection reduces this amount to a far more acceptable and safe level. You may think that just because you took your guns our of your gun safe, you’re outdoors and sound has more places to travel, your ears will be fine without protection. Fundamentally, that’s false. If you’re hunting, chances are you’re using a rifle, which your head is generally close to for accurate aiming. Whether you’re indoors or outside, the sound of that gun going off is going to have the same effect on your ears. Since you are hunting, you may not want to have the added weight of earmuffs, which is why earplugs come highly recommended for hunters. Even if you don’t want to deal with the bulk and weight of earmuffs, you may be surprised to find that “passive” earmuffs, or non-electronic, can serve as a great option for hunters as they don’t tend to have a lot of extra weight. Under each earmuff and earplug, you probably took notice of the “Noise Reduction Rating.” This rating, often referred to as “NRR” for short, is the unit used to measure how effective a protective hearing accessory. This scale usually ranges from a low of 22 dB to a high 30 dB, though there are options out there that stretch beyond those boundaries. The American National Standards and the Occupational Safety and Health Administration implemented the NRR for workplace safety, but it does pertain to protection from gunshot noise. While shopping, you’ll want to keep an eye out for higher ratings as they offer the most protection. They can, however, make it difficult to hear ambient noise, so if you’re a hunter, try to find an option that filters out high-decibel sounds while amplifying lower noises. All methods of ear protection should be accompanied by an NRR number. If there isn’t one associated with the item you’re eyeing, ask the manufacturer or skip it entirely as it may not have been rated and, therefore, is likely not a viable option for hearing protection. Now that you know what’s out there and why you should consider wearing ear protection, it’s time to start narrowing down the options with this extensive buyer’s guide. The first thing you’ll need to do is determine what kind of ear protection is best for you. Earmuffs and earplugs serve the same general purpose, but they do offer two completely different experiences. Outside of the obvious – one is hidden and the other is very-much-so visible – there are some clear differences between plugs and muffs that may make one better suited for you over the other. When it comes to being “feature-rich,” earmuffs typically always beat out earplugs. As plugs are a simple design that fits inside your ear, there isn’t much room for added features. Earmuffs, on the other hand, can include things like a 3.5 mm jack for audio input that’s compatible with most media devices. Beyond allowing you to listen to your own music or radio, earmuffs may also be designed with microphones that amplify low-level sounds. These come in handy when you want to be able to hear conversation around you or while you’re out hunting and don’t want to miss out on your target scurrying away out of your line-of-sight. In regard to durability, earplugs are often more difficult to break. There isn’t much to their build and the complete lack of mechanics means they’re less likely to break after a period of use. Most earplugs are designed from a durable silicon or foam that could tear over prolonged use but is less likely to do use. Earmuffs, especially those with electronic features, have more than can break. From the hinges that connect the headband to the cups to the jack for media device compatibility, you may run into issues later on down the road, especially if you’re not careful with your muffs. By far, earmuffs are much larger than earplugs. This can be a benefit and a hindrance, depending on how you look at it. On one hand, the larger size means you probably won’t lose them. Earplugs, especially those not stored in a carrying case, can be easy to lose for the disorganized person. Even carrying cases for earplugs are typically on the smaller side. On the other hand, earplugs are much easier to transport, even when in a carrying case. Earmuffs take up a lot of space in a backpack or even in home storage. Since they are more fragile, how you store your earmuffs is also important to keep in mind so they don’t break. Pinpointing the best earplug for your personal use can be a mix of finding a high enough NRR and personal preference. Outside of the NRR, you also want to take a look at the earbud design. Do you think it’s something that would fit comfortably in your ear? Look at product reviews to see if they fit snug or are loose. If you have a larger or smaller canal than what’s “normal,” you’ll need to keep information like this in mind. Be mindful of the composition of your earplugs. Some are made from a silicon material, which can irritate users that are allergic to silicon. Earplugs made from foam may not be anti-microbial, which can also irritate or transfer unwanted viruses. Since earplugs are typically very bare-bones, you won’t have to worry too much about thinking of what added features you’ll want. Finding the right earplug may come down to just two or three factors, but pinpointing the perfect earmuff is a little more difficult. First and foremost, size is a concern, not just of the cups but of your head, too. Be sure to consider the size of the headband to guarantee a comfortable fit. If you have other accessories, like safety glasses, or are firing with a rifle, you’ll want to keep an eye on cup size, as well. Larger cup sizes, while effective in noise reduction, can get in the way. Beyond comfort, you also want to consider convenience. Do you want an earmuff that has a lot of added features? Do you want to worry about changing batteries or failing electronic components? Are you hoping to listen to music while at the range? These are all things you need to ask yourself as you start to look at earmuffs. Unlike plugs, earmuffs can have added features, such as an audio jack or noise-amplifying microphones. If you’re at the range often and like to talk to those around you, you may have to consider a pair that amplifies low-level sounds. This feature also comes in handy for hunters, but as a hunter, you also need to ask whether you think earmuffs will be too bulky to wear all day. This may be most important. You have to be comfortable wearing your protective hearing aid or else you may find yourself not wearing it as often. For earplugs, make sure it’s a material you find soft and comfortable. For earmuffs, make sure the band is large enough so it’s not putting unwanted pressure on your head. The cups themselves should also be pliable and soft while still delivering on their intended use. Earplugs are mostly invisible to those around you, but they can come in vibrant colors that may make them implausible for hunters. Earmuffs aren’t typically brightly colored and some even come in camouflage. While you’re shopping, just remember that you are wearing them, and they should appeal to you. Don’t, however, let appearance completely sway you from purchasing a durable option that has every feature you need and want. Earplugs don’t generally have the space or capability for added features, earmuffs most certainly do. If you just want a model that does its just and nothing else, you’ll want to sway from electronic earmuffs. Otherwise, you’ll be looking at options that can play music, amplify low-level noises, and auto shutoff after a period of lack of use. For earplugs, you may find options that have a detachable cord and interchangeable tips. Some can even have two noise reduction ratings. Remember that we’re talking about protecting your hearing. Try not to let price be too big of a factor in the deciding process, though you may be surprised just how inexpensive some ear protection can be. Earplugs, in particular, are typically very inexpensive without sacrificing quality or NRR. More expensive models will offer more in the way of features or construction materials, but may also not necessarily increase the protection for your ears. While you’re shopping, you’ll happen across two different earmuff options – passive and electronic. Just as they sound, one runs off of a battery while the other is without any electronic components. Both have their perks and downfalls which we’ll look at briefly. Right off the bat, the issue with an electronic earmuff is the need for a power source. While some come with a rechargeable battery, others may require AA or AAA options that can die out quick. They can, however, provide a greater amplification of softer noises and muffle unwanted harmful sounds. Electronic earmuffs may also offer an MP3 audio jack so you can bring along your favorite music or radio station. If you tend to enjoy the shooting range alone, this could be a great option to keep you entertained while still drowning out your firearm. Passive earmuffs work without the need for electronics. They’re simply a headband and two cups, and while they aren’t powered, they can provide the same ample hearing protection. While they’re generally featureless, the lack of electronic components could make them last longer, make them lighter to wear, and even make them cheaper. For the most part, the NRR of passive earmuffs shouldn’t be too different, but they may not have a capability to amplify low-level, ambient noise or conversation happening around you.